There are many foreign students learning Chinese in MandarinGarden mandarin school, and when traditional festival coming, they will feel unique festal atmosphere. 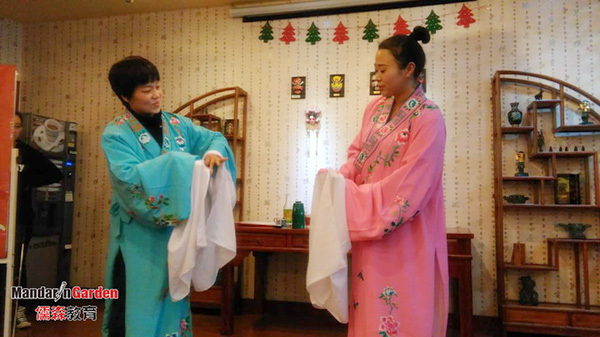 This year's Christmas, for example, students enjoy the Chinese culture and etiquette performances, tells about the various dynasties classical historical story, and different style, has the same high level of happiness. Wearing Hanfu, the Chinese teacher have changed, they are all beyond recognition, high hair accessories, crown, wide sleeves. Shaoxing opera is soft and the feature of the singing, let the foreign students feel the original Chinese art form so special, full of flavor. In the MandarinGarden mandarin school, all the Chinese teachers used to work in all walks of life, some is after graduation from university began to spread Chinese language and traditional culture in love with the path which is full of fun. Here to build a relaxed and lively atmosphere of Chinese wind to foreigners. They can practice calligraphy, painting traditional Chinese painting, playing guzheng, or appreciate the tea ceremony performance and so on. Prev: Foreigners in MandarinGarden how to celebrate Christmas?